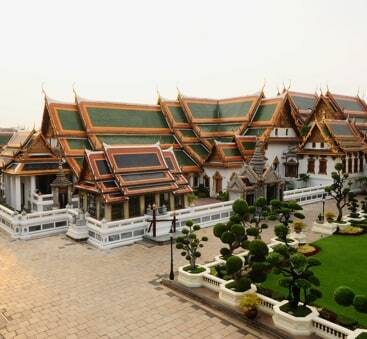 The Grand Palace complex was established in 1782 and it consists of not only royal and throne halls, but also a number of government offices as well as the renowned Temple of the Emerald Buddha. It covers an area of 218,000 square metres and is surrounded by four walls, 1900 metres in length. 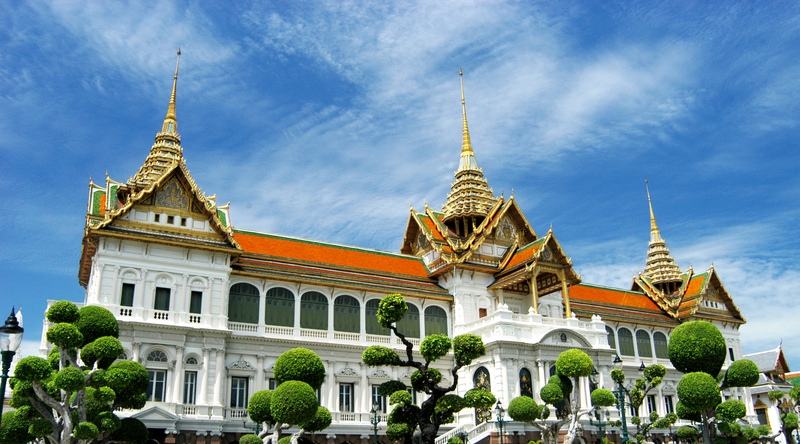 After King Rama I ascended to the throne in 1782, the palace was built. 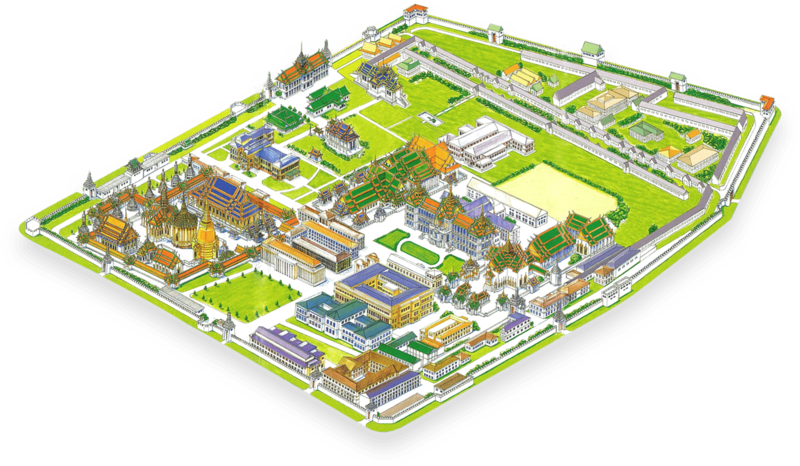 Prior to this, the royal palace and centre of administration had been located in Thonburi, on the west bank of the Chao Phraya River. For various reasons, the new King considered the former capital to be unsuitable and decided to establish a new capital on the other side of the river. 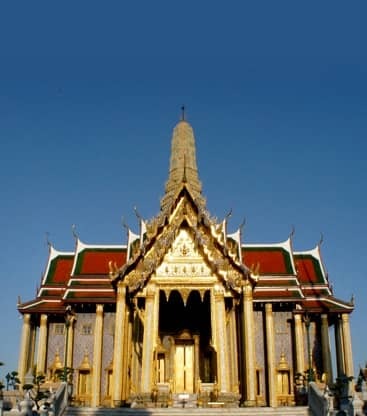 Commonly known as Wat Phra Sri Rattana Satsadaram in Thai or Wat Phra Kaew, was established by King Rama I in 1782. 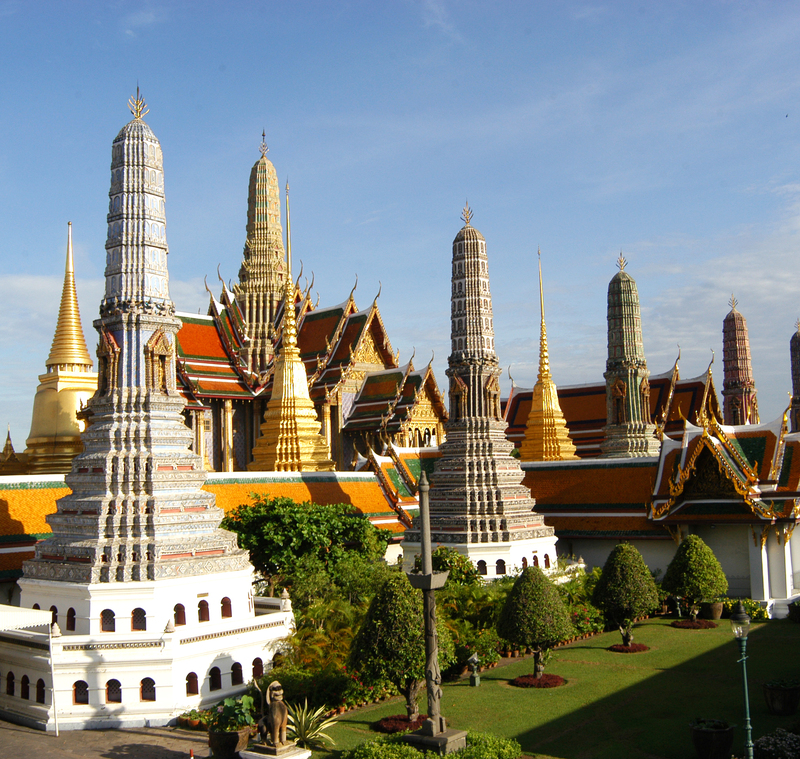 This temple is located in the area of the Outer Palace to house the Emerald Buddha. The tradition of construction a Buddhist temple in the precincts of the royal palace has existed in Thailand since the Sukhothai period, about 800 years ago. 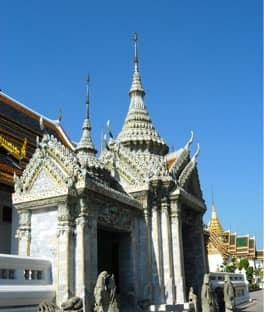 The unique aspect of the royal temple in the palace such as this temple is that it has no living quarters for Buddhist monks. Phra Ubosot or The Chapel of the Emerald Buddha is the most important building in the temple was built by King Rama I in 1782. 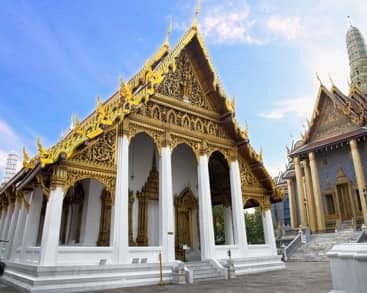 It’s the ordination hall in real Thai style architecture, the style of Ayudhaya period, used as an ordination place for Buddhist monks because it is surrounded by double sacred boundary stones, which mean royal chapel place in small pavilions. 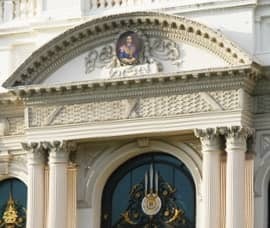 The outside walls of the building are decorated with gilt and colour glass mosaics. Phra Ubosot or The Chapel of the Emerald Buddha (No.10) is the most important building in the temple was built by King Rama I in 1782. 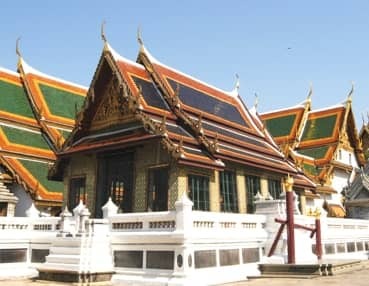 It’s the ordination hall in real Thai style architecture, the style of Ayudhaya period, used as an ordination place for Buddhist monks because it is surrounded by double sacred boundary stones, which mean royal chapel place in small pavilions. The outside walls of the building are decorated with gilt and colour glass mosaics. The mural painting on the wall behind the Emerald Buddha represented the scene of Buddhist cosmology, whereas the front shown the scene of the enlightenment of the Lord Buddha. The Emerald Buddha is the Buddha image which was carved from a block of jasper. The image itself measure 66 cms. high include the base and 48.3 cms. wide, in the attitude of meditation. Judging from the image’s style, the Emerald Buddha is of northern Thai workmanship and was probably made in 15th century, and regarded as the most important Buddha image in Thailand. There are three different costumes of the Emerald Buddha, one of season, they are summer, rainy season and winter. The first two seasons costumes were made in the reign of King Rama I and the last one for winter was made in the reign King Rama III, all made of gold and jewelry. The ceremony of changing the costume of the Emerald Buddha takes place three times a year, at the beginning of new season by the King. There are six pairs of them, standing at the gate of the gallery. Most of them are facing to the chapel of the Emerald Buddha. 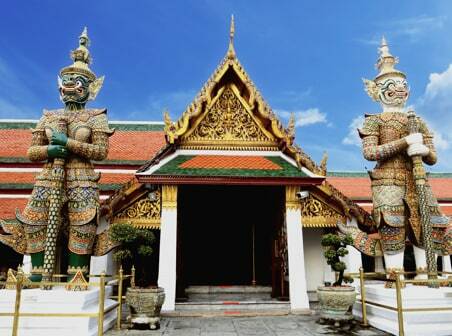 It’s meaning that they are guarding The Emerald Buddha from all evil spirits. These demon statues were built in the reign of King Rama III. Each one is an important character in Rammakian story, the most important literature in the reign of King Rama I. 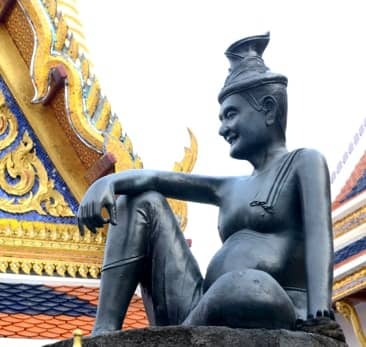 This statue named Cheewok Komaraphat, a patron of Thai medicine, was built in the reign of King Rama III. He was a doctor of the Lord Buddha and now he is regarded as the father of Thai herbal medicine. In front of him is placed a mortar and a grinding stone, which in the old days were used by the believers to grind the medicine which was more efficacious than anywhere. 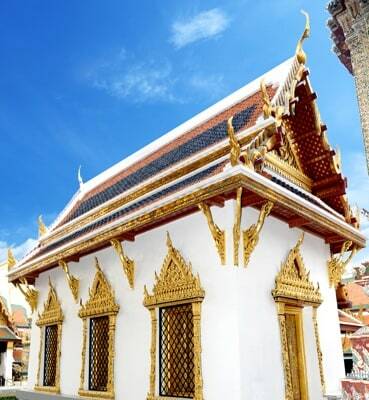 A twin building in Thai style behind the chapel of the Emerald Buddha are the chapel for many Buddha images were built by King Rama IV, on the north is named Hor Phra Rajkoramanusorn, housing 34 small Buddha images, dedicated to 33 Kings of Ayudhaya and one King of Thonburi. The building on the south is named Hor Phra Rajphongsanusorn, housing 8 small Buddha images, dedicated to the King of Bangkok period. 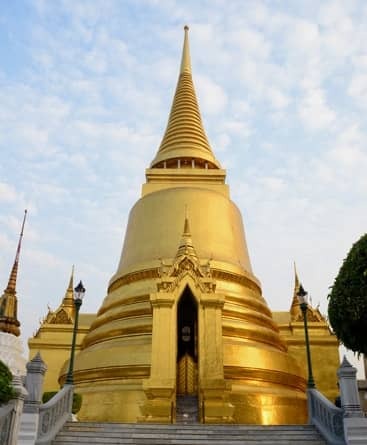 This golden stupa is called Phra Siratana Chedi in Thai. 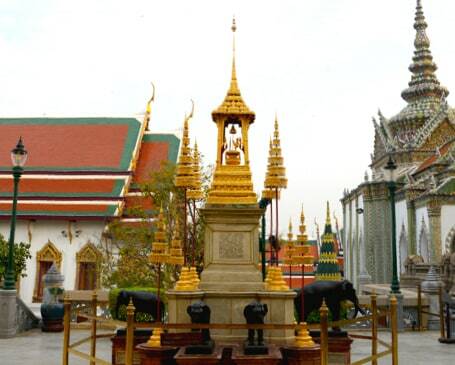 It was erected by King Rama IV in 1855 for enshrining the Relics of the Lord Buddha. This stupa has a circular base and a bell shape which is in the Ceylonese style. The original of this one was cover with the white wash and the golden tile mosaics were applied to the stupa in the reign of King Rama V.
This Building is the Buddhist library, called Phra Mondop in Thai. 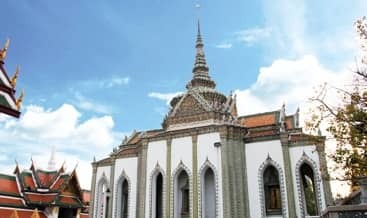 It was built during the reign of King Rama I in 1789 for containing a large beautiful mother-of-pearl inlay book cabinet to house the Buddhist scripture. Around the library are four small pillars surrounded by elephant statues. 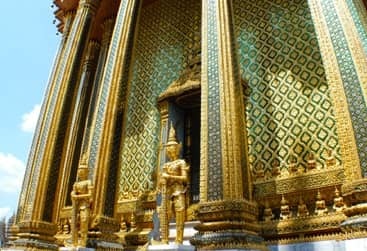 In gilt pavilions on the pillars contain the royal emblems of all the Kings in Bangkok period. At the base of the gilt pavilion, you can see bronze models of auspicious white elephants. They are different in number due to the number of white elephant in each reign. 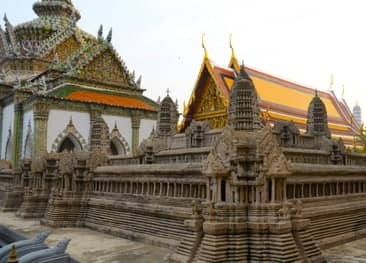 The Royal Pantheon or Prasat Phra Dhepbidorn in Thai, a pavilion having a prang summit, it is a mixture of Thai-Khmer style.It was constructed by King Rama IV in 1856.At first the King wanted to transfer the Emerald Buddha from the main chapel to enshrine inside this building. But after this building was finished it was found to be too small to perform any ceremony. So it was left vacant. Later, King Rama V transferred a small golden stupa from Sivalai Garden which is inside the Grand Palace, to enshrine inside this building. 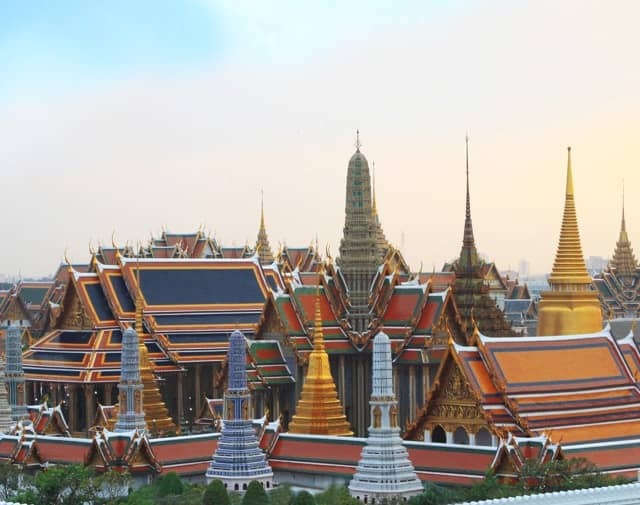 But in 1903,a great fire broke out on the roof of the Royal Pantheon because the electrical wires had worn out.The restoration was accomplished in the reign of King Rama VI,and turned this building to be the Royal Pantheon of all Kings in the Bangkok period. At present, eight statues of the previous Kings are enshrined inside this building. A model of Angor Wat, the Khmer temple in Cambodia. It is an impressive example of Khmer architecture of the 12th century. King Mongkut or King Rama IV had it built for his subjects to see what the Khmer ruins looked like. The original Angor Was in Cambodia was built by King Suryavarman II. The real one is very large, about 1,000 metres length and 800 metres width. A model of Angor Wat, the Khmer temple in Cambodia. It is an impressive example of Khmer architecture of the 12th century. King Mongkut or King Rama IV had it built for his subjects to see what the Khmer ruins looked like. The original Angor Wat in Cambodia was built by King Suryavarman II. The real one is very large, about 1,000 metres length and 800 metres width. The eight prang or towers are standing on the east of the temple were constructed during the reign of King Rama I. 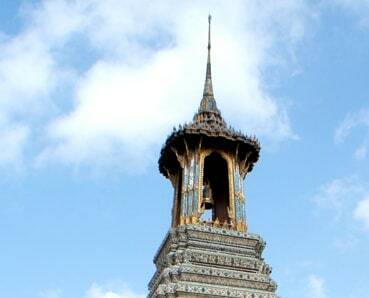 A prang has the same function as a chedi which is a monument one worthy of veneration. They are different colours each one is dedicated to a certain Buddhist concept. The original one built by King Rama I to enshrine Phra Naga image, a standing Buddha image copper alloy and taken from Ayudhaya by King Rama I. But in the reign of King Rama III, the need arose for a rather large building to keep the ashes of the decease members of the present dynasty. 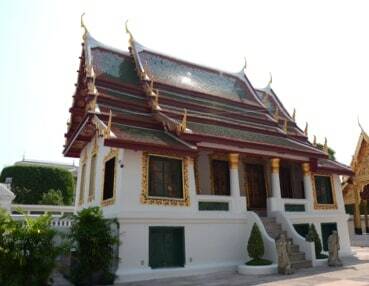 King Rama III had the original Hor Phra Naga pulled down, and built instead by this building to preserve the ashes of the decease princes and princesses. The Phra Naga image was transferred to Phra Wiharn Yod. But the King still kept the old name of Hor Phra Naga until now. 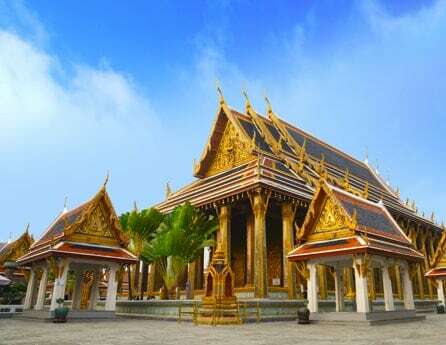 It was built by King Rama III and used as the chapel of many Buddha images, one of them is Phra Naga image which was transferred from Hor Phra Naga. 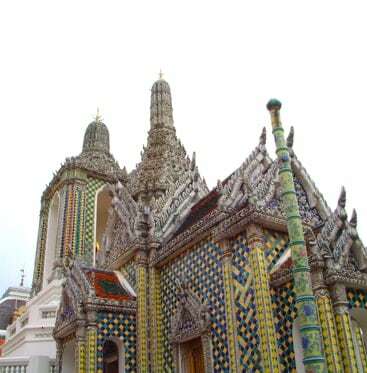 The superstructure is in the from of Thai crown decorated with colour porcelain mosaics from China. It’s the auxiliary library, was built by the prince of Front Palace, the younger brother of King Rama I. Inside this building, there are many mother-of-pearl inlay book cabinets for housing various Buddhist scriptures. The central door panels of this building are inlaid with mother-of-pearl too and has an inscription saying that they originally belonged to Wat Borom Phuttharam in Ayudhaya and were made by King Boromkot, King of Ayudhaya in early 18th century. 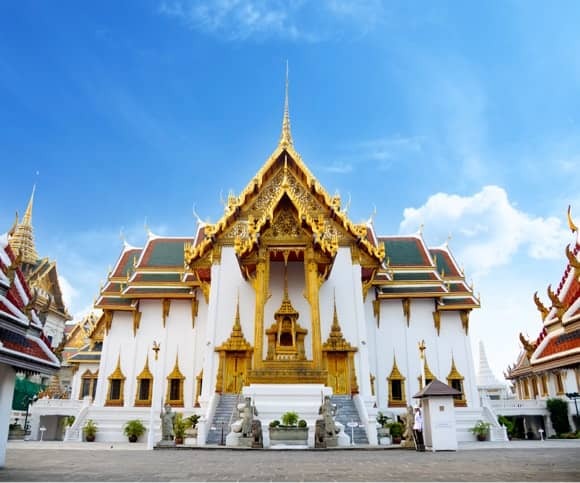 It was erected by King Rama IV and used as the chapel of Phra Gandhararat, the Budha image is believed to contain a magical power for involking rain and is worship for agriculture purpose. The belfry tower is constructed by King Rama IV, decorated with colour porcelain mosaics. The bell is now rung only certain occasion such as when the new supreme patriarch is nominated. The gallery which surrounding every buildings in the temple, there are mural paintings which depict the story of the Ramakien, the Thai version of the Indian Ramayana epic. 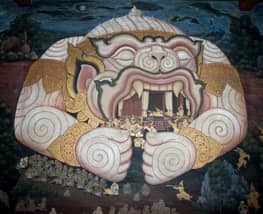 This story is the battle between Tosakanth who is the King of demons and King Rama (human being). The story tell about Tosakanth kidnaps the Queen of King Rama whose name is Sida, and takes her to Longka city, where he hopes that she will fall in love with him but she doesn’t. 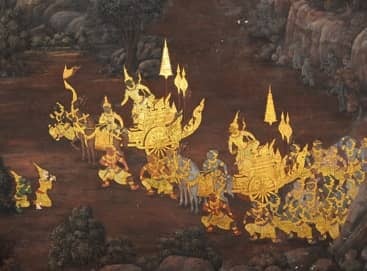 In the battle that follow, Tosakanth asks his innumerable relatives and friends to join him, whereas King Rama has a monkey army and the great monkey worriors under his command. Finally, Tosakanth is defeated and King Rama takes Sida back to Ayodhaya, his capital city. The painting consists of 178 sections. The first picture is located just opposite of the Spired Hall. And they proceed in a clockwise directions. 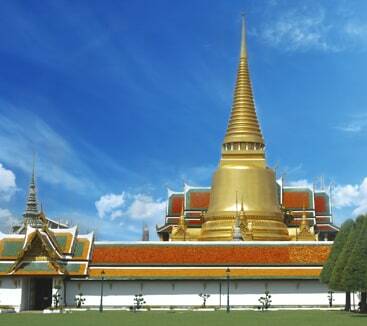 The painting were first done in the reign of King Rama I and have been renovated many times. Phra Thinang Amarindra Winitchai Mahai Suraya Phiman or Amarindra Winitchai Hall is the first part of Phra Maha Montian Group. This hall was built by King Rama I in 1782. It was the formal audience hall where the King met his officers of state and foreign Ambassadors. The two British ambassadors, John Crawford during the reign of King Rama II And Sir John Bowring during the reign of King Rama IV, Were both received to present their credentials here. Today this hall is used for many state occasions such as coronation ceremony, the King’s birthday ceremony and other special occasions. 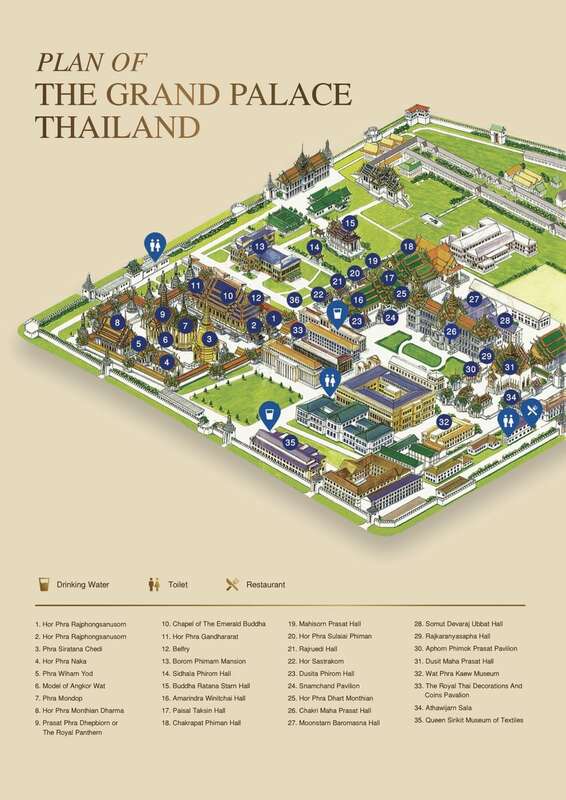 It was built by King Rama IV as a replacement for the one built by King Rama I which he himself had demolished. 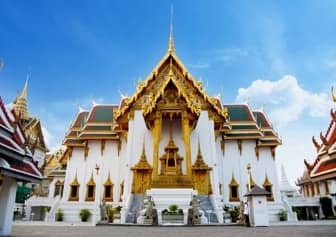 It is used as a chapel by a chapter of monks of Ramana Sect every Buddhist Holy Day for ceremony of making holy water used in the daily ablution of the King and sprinkling over the compound of the Phra Maha Montian. Originally it was built as an open pillared hall of wood by King Rama I and it was enclosed by a curtain wall of masonry by King Rama III. It was used as a changing room for the King to change his regalia before going out to a platform to mount on a palanquin or the elephant. This building was a royal residence built by King Rama V in 1877. The original design by the British architect, Mr.John Clunish, called for three domes over the building. But by the suggestion of the former regent, Somdej Chao Phraya Borom Haha Sri Suriyawong, King Rama V had them changed to Prasat spires. 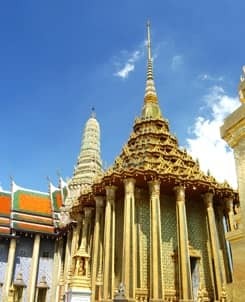 So, this is the only one building in The Grand Palace that mixed the lower part of the throne hall in European style with Thai style roof. King Rama V used this building as his residence. Later it was used by the King to receive the credentials from ambassadors. And now, this building is used for state banquets. It is three-storeyed building, built on the paln of the letter “T”. The front of the building consists of three parts. They are the East Wing, the Central and the West Wing. These parts are connected by long corridors. • The first floor is used as an ancient weapon museum. • The room on the second floor of the East Wing is used as reception room, and the room on the third floor is used as repository for objects of worship of the Kings. 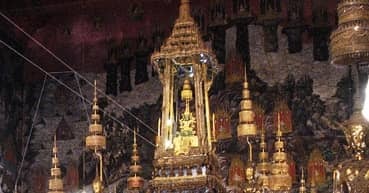 The room below the central Prasat roof is used as a shrine for the ashes of King Rama IV to VIII and principal Queens of King Rama IV, V and VII. The room on the second floor of the Central is the front hall. • The room on the second floor of the west wing is used as reception room. On the third floor of the west wing, that room is used to keep the ashes of the lesser Queens and members of the royal family. • On the second floor of the east corridor, there are picture of Kings and on the west corridor, there are pictures of Queens. 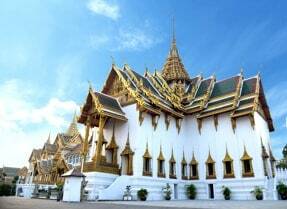 Dusit Maha Prasat Hall or Phra Thinang Dusit Maha Prasat in Thai, is the grand spired hall. It was built by King Rama I as a replacement for an earlier wooden Phra Thinang Amarintharaphisek Maha Prasat which burnt down in 1789. King Rama I intended that present building be used for his own lying-in-state as it has the same height and Dimensions as the Phra Thinang Suriyamarin in Ayudhaya, The customary hall for lying-in-state of Ayudhaya Kings.Thus the principal function of this hall for lying-in-state of Kings, Queen and members of the royal family. This hall is also used for the annual Conseration Day Ceremory. The principal function of this hall for lying-in-state of Kings, Queen and members of the royal family.